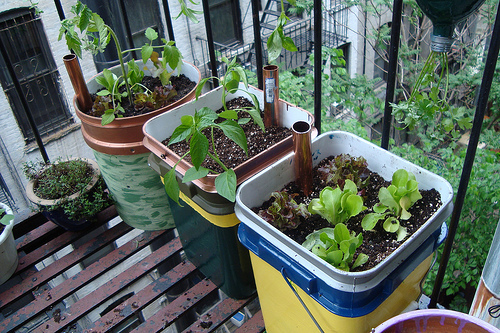 A self watering planter can come in a variety of forms. 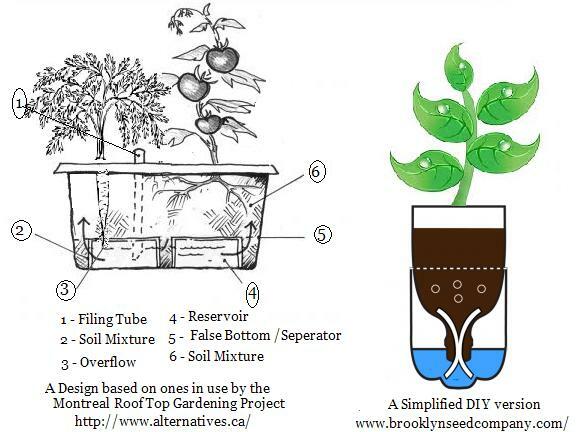 One of the easiest versions in a simple sub-irrigated system made from a bucket or bin. These systems differ from regular planting containers in that in self-watering containers the roots self-manage their watering needs between watering by sucking up the water from the water reservoir container below the soil using a wick. In a traditional container when you water the plant from the top a percentage of the water you pour doesn’t even make it to the roots. These sub-irrigation systems help keep the soil moist at the bottom during dry times and lengthen the time between watering. Plus, these container systems don`t take up a lot of space and are easy to move! One issue many gardeners face is how they would keep their plants fresh with water when they are not around for a few days. Some container planters will even need to be watered multiple times a day in the hottest part of the summer. Self-watering systems as well as drip irrigation systems can provide a simple a low-tech solution. For example, a self-watering sub irrigated system holds water in the reservoir and works with osmosis; when the soil is drying out, the water in the reservoir is drawn up again using the wick. There are several variations on making a self-watering container. Search online for more inspirational ideas! Below you`ll find instructions for one of the more simple systems. Any of the following places will gladly either give them to you or sell them to you for $1 – Bakery, deli, restaurants, or you can find them on the curb on recycling day. First, Use the 1/4″ drill bit to drill holes in the wicking basket. Drill holes in the bottom of the planting container to allow for drainage. Place the buckets into one another, and drill several holes in the side of the reservoir bucket just below the point where the planting bucket ends inside. This hole will allow excess water to exit the reservoir during a rainstorm. Attach the 3 1/2″ hole saw attachment to the drill. Drill a hole in the centre of the bottom of the large bucket. Using the 1 1/4″ hole saw, drill a hole near the edge of the planting bucket. This is for the watering tube to reach above the soil and down into the resevoir. Cut the PVC tube to 2 feet with one end cut at a 45 degree angle to allow water to flow easily. Place the planting container in the reservoir container, placing the wicking basket with the hole in the middle. Fill with compost-rich potting soil mix and moisten. Plant your plant and water immediately.